Ads in editorial were fully visible for 44 seconds vs. 6 seconds in search and 3 seconds in social. Mobile brand agency Kargo has published a study that argues â€œpremium editorialâ€� digital environments are more effective for brand ads than search or social media. 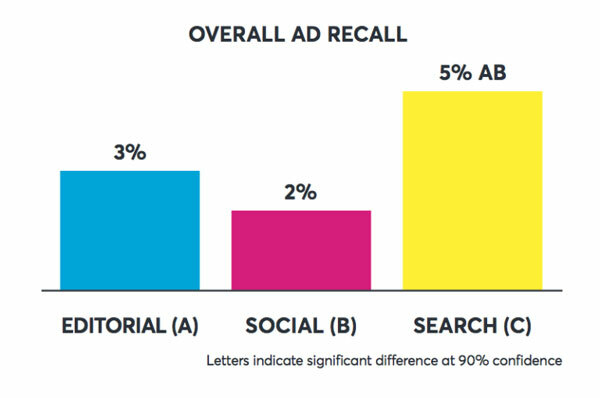 The findings are based on a comparative study of ad visibility and recall. One hundred smartphone owners were exposed to â€œpremium editorial, social and search content in a live in-market test.â€� Participants were given â€œ10 minutes within each environment to experience the content as they normally would in a use session.â€� Eye tracking and post-exposure surveys were used to measure reactions and later ad recall. The research was conducted in partnership with Nielsen. A single unidentified publisherâ€™s website was used as the editorial test site. Participants were exposed to their own social feeds, and a set of â€œcued search categoriesâ€� was used to measure the efficacy of ad exposures in search results. Itâ€™s not clear if the ads tested across channels were similar or the same. 1. How visible are ads in these different environments? 2. How many ads are actually seen by the human eye in each environment? 3. How well are ads in these environments remembered? Search had the strongest unaided overall recall. 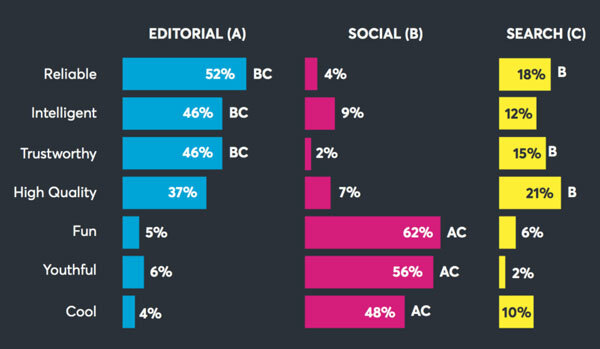 But editorial beat social, which seems to be the big takeaway from the study. Several other recall scenarios were tested, with somewhat different results, which is why the chart above appears to contradict the big findings of the study. Copyright 2017 Third Door Media, Inc. All rights reserved. From http://marketingland.com. By Greg Sterling.